Burrell Vineyards and Winery occupies a knoll overlooking Summit Road in the Santa Cruz Mountains. 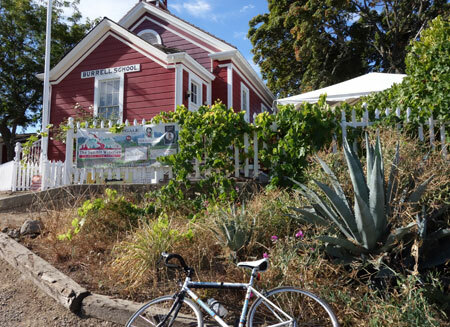 Today’s history lesson is about Burrell School in the Santa Cruz Mountains on Summit Road. It opened in 1877. However, the building you see today is not the original. It burned in a grass fire in 1899 and was rebuilt. It looks like it closed around 1954 and was sold. Dave and Anne Moulton bought it in 1973 and opened the current Burrell School Vineyards and Winery. They have whimsical names for their wines: Teacher’s Pet Chardonnay, Schoolyard Petite Sirah, Detention Red Zinfandel, etc. As I returned on Schulties Road, the long suffering dirt road does see maintenance. County work crews shored up two sags in the road with substantial lumber construction. 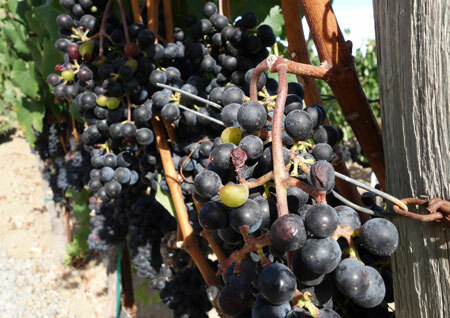 It won’t be long before the harvest begins at vineyards in the Santa Cruz Mountains. Squish, squish. This entry was posted on September 23, 2012 at 4:25 pm and is filed under News. You can follow any responses to this entry through the RSS 2.0 feed. You can leave a response, or trackback from your own site.